Flat agricultural land dotted with cities and suburbs surrounding Toledo and stretching into Indiana to the west and Michigan to the north. Contains the Firelands communities, as well as many resorts along the Lake Erie coast. rolling wooded foothills from the Allegheny Mountain range subside as they approach Lake Erie (definition of NEO includes 13 counties and 4.5 million people). Ohio's capital Columbus and the surrounding metropolitan area. The city of Cincinnati and the portion of the surrounding metropolitan area that lies in Ohio. Very hilly, coal-mining country in the foothills of the Appalachian Mountains, rolling into Pennsylvania and West Virginia and including the Wayne National Forest. Akron - the county seat of Summit County, used to be known as the Rubber Capital, and has made the transition from the world's tire manufacturing hub to its high-tech Polymers Research Center, now referred to as the Polymer Capital. It is also the home of the All-American Soap Box Derby. Cincinnati - regional hub of 3 million residents (Cincinnati Metro and Dayton Metro), the "Queen City" is home to the Bengals and Reds. Cincinnati was the first boom town in the United States, and its Over-the-Rhine district is the largest National Historic District in the United States. Dayton - a mid-sized city famous for being the home of the Wright Brothers, Wright-Patterson Air Force Base and the Dayton International Peace Museum. Dayton can be a wonderfully charming place to visit. Newark - a city with historical ties to the glass-making industry and the second-largest city in central Ohio, Newark is the home of the "Basket Building," a 4-story picnic basket-shaped building which is the corporate headquarters of the Longaberger Co.
Sandusky - home to Cedar Point Amusement Park. Toledo - "The Glass City" is home to the Toledo Mud Hens Baseball team, a world-class art museum, a nationally ranked zoo, and the famous Tony Packo's Cafe. Cuyahoga Valley National Park - The only national park in Ohio. According to the US National Park Service, the Cuyahoga Valley is the 5th most frequently visited park in the National Park System. Lake Erie Islands - north of Sandusky (between Cleveland and Toledo), a group of picturesque and festive islands in Lake Erie are accessible via ferry. In addition to several Ohio state parks on the islands, there is plenty to do including visiting wineries, restaurants, bars, marinas and beaches. One of the Islands, Put-In-Bay, is known as the "Key West of the North" for its party atmosphere, especially during the summer months. North Coast Beaches - Along the southern shore of Lake Erie are a large number of public beaches. The largest natural sand beach in Ohio, Headlands Beach State Park, is east of Cleveland, in Mentor. Cleveland Lakefront State Park also includes a large beach at its Edgewater Park, just west of downtown Cleveland. Many other beaches are available throughout Northern Ohio, including Huntington Beach, Euclid Beach and Fairport Harbor. In addition, Maumee Bay State Park, near Toledo, boasts an extensive Lake Erie Beach as well as an inland beach and various resort and banquet facilities, not to mention a challenging Scottish-links style golf course. Ohio State Parks - Ohio has many states parks, spread throughout the state. Fees vary from park to park, but all are very affordable. To the north, the parks around Lake Erie have some of the best beaches and camping areas. Many have boat launches. Inland, most are in forest areas and offer outstanding amenities to campers, picnickers, boaters and horsemen. Wayne National Forest - in the Southeast portion of the state, includes the scenic Hocking Hills region and Lake Logan State Park. Holmes County - halfway between Columbus and Cleveland, Holmes County is home to the world's largest population of Amish residents, along with famous attractions like Heini's Cheese, Skyview Ranch, the Amish Door and dozens of other historical Amish attractions. Warren County - Warren County, Ohio is the ultimate getaway for Ohio family fun. As the home of attractions such as Kings Island, Great Wolf Lodge, the Beach Waterpark and Ozone Zipline Adventures, Warren County is truly "Ohio's Largest Playground". The Ohio State Buckeyes are known for their competitive college football team, but most Ohioans don't even know why their state is nicknamed after a poisonous fruit! Ohio is commonly referred to as the "Buckeye State" due to the abundance of Buckeye trees in Ohio. The trees grow a nut, which is poisonous to humans and most animals. Native Americans in Ohio called the nut "Hetuck", or "buck's eye" because of its brown circular shape with a small white oval, which resembled a buck's eye. The name "Buckeye State" came into prominence during the Log-Cabin and Hard-Cider presidential campaign of 1840 when furniture, cabins, and cider kegs were made from buckeye wood in honor of William Henry Harrison, who was the first Ohioan to become president. In the election versus Martin Van Buren, the Whig campaign song contained a reference to the buckeye. A far less poisonous and tasty candy is made to resemble to the buckeye, composed of a peanut butter center partially covered in chocolate. The resemblance is striking, and the candies are delicious. Ohio is the 35th largest state by size, but 7th by population (11,459,011 residents in 2004 according to the US Census Bureau). Ohio's nickname is "the Heart of It All", purportedly because of its shape (kind of like a heart), its central location to the densely populated areas of the US, its mosaic of big commercial cities, small towns, industry and farmland, and its critical role in "America's Heartland" (which can refer to the Midwest agricultural sector and the Great Lakes industrial base). Ohio has always played and continues to play a critical role in the development of the United States history and government. One of Ohio's contributions to history was the Underground Railroad network which helped escaped slaves move to the free northern states and Canada. Many Ohioans, most notably Harriet Elizabeth Beecher Stowe and John Brown, campaigned against slavery. Ohio has also been home to eight American Presidents, giving it the nickname Mother of US Presidents. American Presidents from Ohio were Ulysses Grant (18th, born in Point Pleasant), Rutherford Hayes (19th, Delaware), James Garfield (20th, Orange), Benjamin Harrison (23rd, North Bend), William McKinley (25th, Niles), William Taft (27th, Cincinnati), and Warren Harding (29th, Corsica/Blooming Grove). William Henry Harrison (9th), born in Virginia but settled (and buried) in North Bend. Ohio is considered one of the most important states in presidential elections due to its 20 electoral votes and is often one of the few states that can go to either party. Unlike California, Illinois, New York that lean Democratic and Texas which almost always votes Republican, Ohio's voting tendencies changes from election to election. As a matter of fact since 1856 (the first time a Republican ran for president) and including the 2016 election, no Republican has won the presidency without also winning Ohio. Given the somewhat forgettable record of some of the Ohio presidents however, there is a somewhat irreverent saying about presidents: "Some are born great, some achieve greatness and some were just born in Ohio". The Wright Brothers, Orville and Wilbur, inventors of the airplane, were from Dayton in Ohio, giving the state one reason to call itself the Birthplace of Aviation (though the brothers actually flew the airplane first in Kitty Hawk, North Carolina, Dayton was their home and the place where they conducted their research, development, and fabrication activities, as well as test-flights of various glider prototypes). Ohio, however, has additional claims to the nickname. Neil Armstrong, the first man to walk the moon, was an Ohioan, as was late U.S. Senator and astronaut John Glenn, who was the first the American to complete an orbit of the Earth from outer space. Ohio has also been home to 23 other astronauts and is home to the Wright Patterson Air Force Base near Dayton, the NASA John H. Glenn Research Center in Cleveland, and National Museum of the United States Air Force in Dayton. Inventor Thomas A. Edison was born in Milan, Ohio. His birthplace and home have been preserved. Despite what you may have heard, Ohio is very diverse with regional dialects. In the middle of the state, especially Dayton and Columbus, many people speak what is commonly known as General American Dialect, or Standard Midwestern Dialect. Around Cleveland and Toledo people speak with what is known as the Northern Cities Vowel shift of same dialect, sounding way more like a Chicagoan (think Da Bears from Saturday Night Live for a really exaggerated example). In the Amish Country between Cleveland and Columbus English is actually a second language for the Amish populations with Pennsylvania Dutch, their first. Pennsylvania Dutch is related to German. Pretty much all Amish speak English outside of the home but with a distinct accent. In inner cities of Cincinnati, Cleveland, and Columbus there are hundreds of thousands of African-Americans who speak what is called African-American Vernacular English. As you move South and Southeast, you may encounter those who speak Southern American English-- especially in the Greater Cincinnati Metropolitan Area. White non Appalachian populations in the Greater Cincinnati area have a slight dialect differences influenced by their heavily German population with a few local colloquialisms like “Pony Keg” for convenience store, and using “Please?” instead of “What?” when asking someone to repeat themselves. Akron-Canton Regional Airport, 5400 Lauby Road Northwest (Exit 113 from I-77), ☎ +1 330 499-4221. Akron-Canton Regional Airport (CAK IATA) is a small, easy to navigate, quick in-and-out airport. The airport has become home to low-fare airlines such as Southwest. Cincinnati/Northern Kentucky International Airport (Follow I-275 to Exit 4 (State Route 212.) Follow the signs to airport terminals and parking. ), ☎ +1 859 767-3151, e-mail: info@cvgairport.com. Cincinnati/Northern Kentucky International Airport (CVG IATA) is on the Kentucky side of the Ohio River, so you'll have to cross the bridge to get to Cincinnati. Delta has a small hub here. Cleveland Hopkins International Airport, ☎ +1 216 265-6030. Cleveland Hopkins International Airport (CLE IATA) is Cleveland's main airport and by far Ohio's largest, on the west side of the city. The airport is served by all of the major domestic airlines, some international airlines, and it is a hub for United Airlines. The RTA Red Line Rapid Transit (see, below) provides frequent and fast rail service from inside the airport to the heart of downtown in roughly 22 minutes for $1.75. John Glenn Columbus International Airport, 4600 International Gateway, ☎ +1 614 239-4083. John Glenn Columbus International Airport (CMH IATA) is served by most of the major airlines, with direct flights to most major American cities. 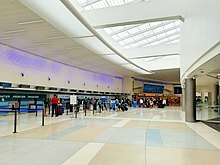 Aside from rental cars, the airport can also be reached by the #92 bus, or by taxi. A taxi ride to downtown will cost approximately $25. James M. Cox Dayton International Airport, 3600 Terminal Drive (in the town of Vandalia), ☎ +1 937 454-8200. James M. Cox Dayton International Airport (DAY IATA) is in the northern part of the metropolitan area. Nonstop service is available to Atlanta, Baltimore, Charlotte, Chicago, Cincinnati, Cleveland, Dallas/Ft. Worth, Denver, Detroit, Miami, Milwaukee, Minneapolis, Newark, New York, Orlando, Philadelphia, St. Louis and Washington, D.C. Dayton is the nation's number one 90-minute air market, meaning the city can be reached in 90 minutes or less by 55 percent of the population. Even if your destination is in a different part of the state, it is often cheaper to fly into the smaller Dayton airport, so it is worthwhile it to compare fares. I-70 splits the state in half, linking Columbus, Dayton and Springfield beyond Pennsylvania to the east and beyond Indiana to the west. I-71 connects the three big cities, starting in Cleveland and running southwest through Columbus and Cincinnati, then beyond Kentucky. I-75 runs along the western part of the state, serving Cincinnati, Dayton, and Toledo and connecting them to Michigan to the north and beyond Kentucky to the south. I-76 serving Akron and Youngstown and connecting to Pennsylvania to the east. I-77 starts in Cleveland and runs south through Akron, Canton, New Philadelphia and Marietta and continues beyond West Virginia. I-80 is the Ohio Turnpike (a toll road) that runs across the northern part of the state, serving Cleveland, Akron, Toledo and Youngstown (where I-80 and I-76 criss cross) and beyond Pennsylvania to the east and Indiana to the west. I-90 also serves the far northern part of the state, including Cleveland and Toledo, merges with the Ohio Turnpike (I-80) for a stretch and continues beyond Pennsylvania to the east and Indiana to the west. Capitol Limited: Daily between Washington D.C. and Chicago, calls at Alliance, Cleveland, Elyria, Sandusky and Toledo. Cardinal: Runs three times per week between Washington D.C. and Chicago, taking a more southerly route via several cities in West Virginia. Its only stop in Ohio is in Cincinnati. Lake Shore Limited: Daily between New York City/Boston and Chicago. Calls at Bryan, Toledo, Sandusky, Elyria and Cleveland. The American Discovery Trail connects Ohio with Indiana, West Virginia and both coasts. Most points within Ohio are easily accessible by auto with longest distances across the state of about 300 miles (480 km) and less than 5 hours in driving time. For instance, driving from Cleveland-to-Columbus and Columbus-to-Cincinnati via I-71 takes about 2 hours (give or take 15 minutes). The larger cities in the state all have public mass transit systems. Greyhound connects over 25 of Ohio's cities. The following cities have a dedicated Greyhound station: Akron, Ashtabula, Athens, Cambridge, Canton, Chillicothe, Cincinnati, Cleveland, Columbus, Dayton, Dover, Elyria, Findlay, Kenton, Lima, Mansfield, Maple Heights, Marietta, Marion, Sandusky, Springfield, Toledo, Van Wert, West Salem, Wooster, Youngstown, Zanesville. State Route 2 (North Coast Scenic Byway) is a principal route between Toledo and Cleveland that provides easy access to not only the Lake Erie Islands but also one of the worlds most famous amusement parks Cedar Point. State Route 3 (3C Highway) runs from Cincinnati to Cleveland via Columbus and receives its nickname from the fact that it runs through Ohio's three largest cities, all of which begin with the letter "C". Like most of the midwest, highways are long, straight, and flat, and drivers are often going long distances--in other words, a hitchhiker's dream. Be aware that most if not all interstate highways are closed to pedestrians, so you're probably better off trying to catch a ride from an on-ramp. I-80 is the preferred route for those trying to travel across the state east or west. If you want to experience all things Ohio, below are some attractions that can guide you throughout the Buckeye State. 39.7629-84.196613 Dayton International Peace Museum. The Peace Museum is in Dayton and is easily accessed from I-75 Exit 53B, First St. Exit. The museum has exhibits about the world's rich, but often overlooked, history of peace and nonviolence. Member of the International Network of Museums for Peace. 39.9338-82.783414 AMA's Motorcycle Hall of Fame Museum. Just east of Columbus, on the campus of the American Motorcyclist Association in Pickerington, Ohio, the non-profit Museum tells the exciting stories and preserves the history of American motorcycling. The museum is also home to the Motorcycle Hall of Fame, honoring the distinguished men and women who have played a vital role in shaping the sport and business of motorcycling, thanks to their competitive spirit, passion, vision and entrepreneurship. The Lincoln Highway. If you are a visitor to United States or Ohio, an alternative to the well developed interstate highway system, is the Lincoln Highway which is an east/west transcontinental highway conceived in 1913 specifically for automobile traffic. It is not a speedy road to follow as it passes through, rather than around the cities and villages on its path from coast to coast. In Ohio it was (not now, in a lot of cases) known as US Route 30, although US Route 30 remains, much of it has been moved from the original Lincoln Highway, to a newer four lane highway also known as US Route 30. In Ohio the Lincoln Highway runs from East Liverpool, Ohio, west to Fort Wayne, Indiana, through the center of Ohio, and through many of its more scenic areas and communities. You will have no problem finding and enjoying food and lodging, that will be extremely different and likely less expensive than the "cookie cutter" offerings along the Interstate highways. 40-82.9931 Ohio State Fair. The annual event celebrating Ohio and its history is held in Columbus. [dead link] Riverfest Presented by Outdoor Source. A service of the Mid-Ohio Regional Planning Commission celebrates Ohio's rivers and waterways. Event activities include boating on the scioto river, live music, educational exhibits, rock climbing and recycled arts. 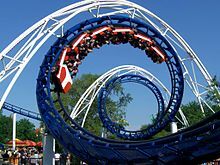 Ohio has been nicknamed the "Roller Coaster Capital of the World" due to the number of record breaking amusement park rides that call Ohio home. The two most noteworthy parks in Ohio are Cedar Point and King's Island. Geauga Lake's Wildwater Kingdom is a waterpark in Aurora near Cleveland. Pioneer Waterland is a waterpark in Chardon, Ohio. Fort Rapids Indoor Waterpark is in Columbus. CoCo Key Water Resort at Cherry Valley Lodge is in Newark near Columbus. Splash Harbor is in Bellville, Ohio. Maple Syrup go to Geauga County in Northeast Ohio, the Village of Burton is the heart of maple country, but maple syrup is produced and is available throughout most of the State. Salisbury Steak created by and named for Clevelander Dr. James H. Salisbury who desired to perfect the meat curing process (you can pay homage to him at Lakeview Cemetery near University Circle). Just ask the Menches brothers who must claim, "It's just a fancy hamburger covered in gravy." 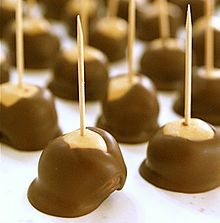 Roasted/Candy Buckeyes - where else would you go for either delicious snack but the Buckeye State? Goetta - is a peasant food of German origin that is popular in the greater Cincinnati area. It is primarily composed of ground meat and oats. Traditionally used as a breakfast meat. Cincinnati Chili - is a regional style of chili characteristically served over spaghetti or as a coney sauce. While served in many regular restaurants, it is most often associated with several fast-food chains in the Cincinnati area, including Skyline Chili, Gold Star, Empress, and Dixie. Ohio's liquor laws are somewhere in the middle in terms of restrictions. Beer, wine, and liquor (42 proof and under) can be found in many stores. It can be sold until 1AM (some stores don't have the permit to sell some or all types of the alcohol on Sundays). Hard liquor can be purchased at state liquor agencies (some of which are found in grocery stores). These stores also sell wine, beer, soda, mixers, etc. and have an earlier closing time. Two provisions may affect purchases of alcohol for personal off-premises consumption. First, it must be sold to you by an employee above the legal drinking age of 21, which can sometimes mean the cashier will have to go find someone who can, and if you're at a convenience store with no other employee available, you're out of luck. Second, it must be carried out of the store in a bag that conceals it, even if it's a single. Like all other states, Ohio vigorously enforces its drunken-driving law. It is also illegal to carry an open container of an alcoholic beverage in an automobile's passenger compartment regardless of who is consuming it. And anyone carrying a firearm, even lawfully, while under the influence can expect to face a charge of using weapons while intoxicated, which can be a felony. The first major winery in Ohio was founded by Nicholas Longworth near the banks of the Ohio River in Southwest Ohio. Due to the fertile land wine producing became one Ohio's important industries and at by the 1860s was leading the U.S. in wine production. Due to crop disasters and prohibition wine producing in Ohio dwindled. Wines produced in Ohio have become increasingly popular, though, still largely undiscovered by tourists and locals alike. Maize Valley Farm Market and Winery, just east of Hartville. Ohio is home to a few microdistilleries. Buckeye Vodka can be found in liquor stores and some bars throughout the state. Most other local spirits are hard to find outside their home areas. Visitors may want to consider staying at one of Ohio's Resort Lodges or State Parks, which are spread throughout the state. Most are very pleasant to visit and offer an opportunity to visit Ohio's great outdoors. The Lodges offer outstanding locations and amenities, while the Parks usually offer primitive camping, camping, backpacking, group camps, horseman camps and boat camping. All are State of Ohio owned, some are operated by contractors. Ohioans passed "SmokeFree Ohio" ballot measure in 2006 banning smoking in most public areas with very few exceptions. Hotels, motels, and other lodging facilities may still allow smoking in designated rooms under the new law. Restaurants and bars are forbidden from allowing smoking or ashtrays on their premises unless they have an outdoor patio. If you're at a place that is in violation of the law you can report the violation to the Ohio Department of Health by calling the toll-free number: 1-866-559-6446. Alternatively, you can email a complaint to NoSmoke@odh.ohio.gov. You must include the following information for a complaint to be followed up on: the business' name, nature of the complaint, a complete address; including the street number, street name, city and zip code. Even if you are driving through Ohio, in the winter months you want to make sure that you have enough clothes to keep you warm in the event you have difficulties. Temperatures often get below 0 °F (−18 °C). Drivers heading into Ohio from the South will want to make sure their vehicles are prepared for freezing weather. Have the antifreeze in your radiator checked as well as replacing any widow washer solvent with a product that will not freeze. Be prepared with extra warm clothes, shoes, head cover and gloves. In general, Ohio is a fairly safe state. During the day most places are completely safe, however, take normal precautions against crime. The biggest threats to visitors are the winter weather and potential for traffic accidents. If you travel by car, be safe while driving in inclement weather and always be aware of traffic alerts around major cities. Ohio is geographically in the Heartland of the United States-- which makes it easy to take a trip to much of the United States of America and even Canada. Indiana- State directly to the west, home of Indianapolis and the Indy 500. Kentucky- State directly to the south, home of Louisville and Lexington, the Kentucky Derby, bluegrass music, and Kentucky Bourbon. Pennsylvania - State directly to the east, home of Philadelphia and Pittsburgh. Known for its revolutionary war era historical sites (mainly in Philadelphia) and its steel industry. Michigan - State to the north, home of Detroit and Mackinac Island. Has about 12,000 inland lakes, 38 deep-water ports, more miles of coastline than any state but Alaska, and more lighthouses than any other U.S. state. Ontario - Canada's most populous province, directly across Lake Erie. Its capital, Toronto, is Canada's largest city, and it hosts the capital of Canada Ottawa. West Virginia - State to the southeast, home of Charleston. It's often called the "Mountain State", being the only state in the USA to lie completely within a mountain range (in this case, the Appalachians). This region travel guide to Ohio is an outline and may need more content. It has a template, but there is not enough information present. If there are Cities and Other destinations listed, they may not all be at usable status or there may not be a valid regional structure and a "Get in" section describing all of the typical ways to get here. Please plunge forward and help it grow! This travel guide page was last edited at 16:54, on 14 April 2019 by Wikivoyage user Mbrickn. Based on work by Wikivoyage users Jonte--, Traveler100, AndreCarrotflower, Ground Zero, Graham87, Mx. Granger, Wrh2Bot, Elassint and AndreeBot and others.